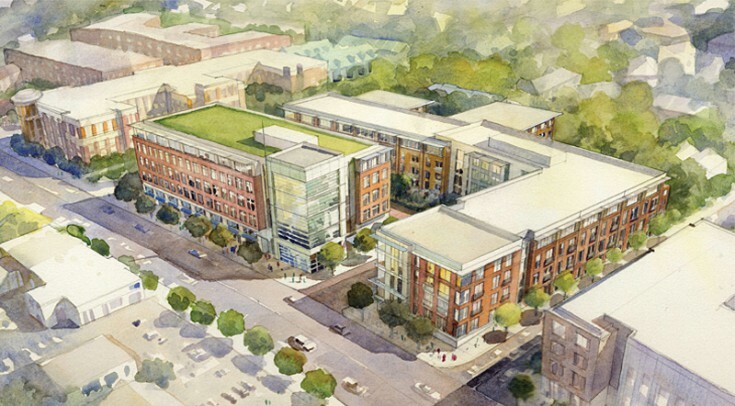 After working with Akridge and the City of Falls Church on a mixed-use development for the the City’s North Washington Street Corridor revitalization effort, the City Council has unanimously approved the project. Falls Church Gateway is an 83,000 sf office/retail and 200-unit residential building located near the East Falls Church Metro Station. The transit-oriented design is consistent with the City’s planning goals and creates a sense of place with a positive pedestrian experience and a sensitive transition from commercial to residential areas. Falls Church Gateway was recognized in 2006 by the Smart Growth Alliance for its sensitivity to adjacent neighborhoods, incorporation of green spaces, and long term goals of a LEED-Neighborhood Development. To learn more about the project or view more images, please visit Cunningham | Quill Architects. For more information on Akridge regarding the project, please see their official press release.